Thousands gathered Sunday morning for the funeral of Michael "Miki" Mark, the 48-year-old father of 10 who was murdered in a drive-by shooting on Friday. The funeral procession began in the town of Otniel, south of Hevron in Judea, where Mark lived, before making its way to Jerusalem's Har HaMenuchot cemetery. Dozens of rabbis and students from yeshivas in the area, as well as MKs, and government ministers heard eulogies for Mark, including an address by President Reuven Rivlin. Rivlin, a distant relative of Mark, noted with regret that he knew little of the man prior to his murder. “We are relatives, but I learned more about you after your death. You were a family man, someone who liked to work with his hands, and a man of letters,” eulogized Rivlin, saying Mark was “honest and humble, [someone who] gave of himself”. Rabbi Binyamin Kelmanson, Mark’s brother-in-law and head of the Otniel Yeshiva, recalled Mark’s tireless efforts to help those in need. Rabbi Kelmanson added with a touch of bitter irony, that Mark gave assistance to everyone around him, including Arabs he encountered near his home in Otniel. Rabbi Kelmanson also warned the government that its continued failure to prevent terror attacks like Friday’s drive-by shooting could lead to frustrated young Jews taking the law into their own hands. 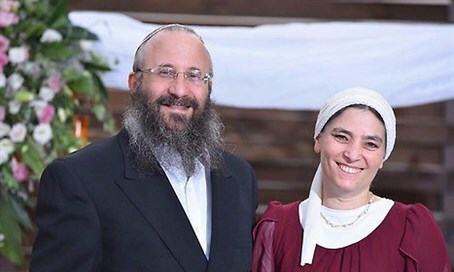 Terrorists fired some 20 bullets in the attack, killing Michael Mark and severely wounding his wife Chava, who is still currently in intensive care. The couple's younger daughter and son - aged 15 and 14 - were also in the car at the time. Their daughter was shot and moderately wounded, while their son was lightly injured as the car flipped over after his father lost control. On Sunday morning their children issued a moving plea to the Israeli public to attend the funeral and show their support and solidarity. Mark's murder came just a day after another deadly attack, in which 13-year-old Hallel-Yaffa Ariel was murdered in her home in nearby Kiryat Arba.